2 Brush zucchini, peppers and onion with oil and sprinkle with ¼ teaspoon salt. Sprinkle salmon with pepper and the remaining ¼ teaspoon salt. 3 Place the vegetables and the salmon pieces, skin-side down, on the grill. Cook the vegetables, turning once or twice, until just tender and grill marks appear, 4 to 6 minutes per side. Cook the salmon, without turning, until it flakes when tested with a fork, 8 to 10 minutes. 4 When cool enough to handle, roughly chop the vegetables and toss together in a large bowl. 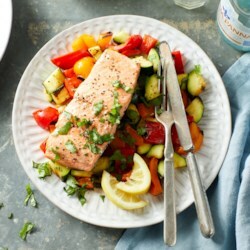 Remove the skin from the salmon fillets (if desired) and serve alongside the vegetables. Garnish each serving with 1 tablespoon basil and serve with a lemon wedge.